Illustration of the carrack Henry Grace a Dieu. Historians at the University of Southampton have, for the first time, visually represented the complex and sophisticated nature of merchant trading routes and maritime ports operating during the late medieval and Tudor periods. Researchers have launched an interactive map and database which brings together an abundance of information about trading centres in England, Wales and the Channel Islands and the individual voyages which set sail from them. Principle Investigator Dr Craig Lambert says: “Our website and maps give a fascinating insight into the structure of shipping in England and Wales during what was a period of fundamental importance to our history; a time when the seeds of maritime empire were sown. 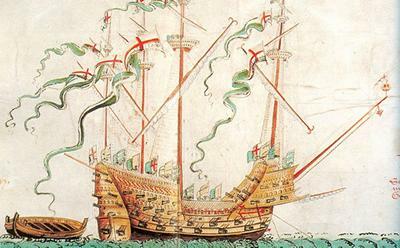 Funded by the Arts and Humanities Research Council, the website www.medievalandtudorships.org consists of a database, searchable by port, crew or voyage and two interactive maps, showing shipping routes, departure points and destinations. Users can zoom in on individual areas and search for information about each port, ship and journey. The historians collated a mountain of data on 50,000 ship movements from over 600 ports between 1400 and 1580 – sourcing evidence from customs accounts, navy payrolls and national ship surveys. The project revealed some intriguing facts about trade and trading centres. It showed the vast majority of ships during the period were travelling within or around England and Wales, rather than venturing abroad. Dr Lambert explains: “The sea and rivers were vital to trade, much as our motorways and railways are today. Merchant ships made short journeys inland by river, sailing between cities and towns. They also used the sea to hop along the coast or, for longer distances, move goods from one side of England to the other. These voyages could take days, but were still quicker and easier than trying to use roads, which were mostly little more than dirt tracks. The research uncovers a myriad of different medieval ports within and around England and Wales. Some are still familiar to us today, such as Southampton, Falmouth, Cardiff and Liverpool. However, the records also highlight a number of places which were once thriving ports, but now little know or more familiar for other activities. Bewdley on the River Severn, now better known for its historic railway, was once a bustling inland port, running ships to Bristol and North Devon. 200 voyages were logged in the database. Now a quiet seaside location in Norfolk, Cley-next-the-Sea has references to over 300 voyages, with ships travelling to Gdańsk in Poland, Bayonne in France and more locally to Whitby and Devon. Millbrook in Cornwall used to be one of the most important ports in the county, but is now more familiar as a haven for bird watching. It once traded both within England and also across the Channel with France. The maps also highlight much smaller locations, which don’t have an immediately recognisable maritime past, such as the coastal villages of Ingoldmells and Marshchapel in Lincolnshire. Also, Fishlake near Doncaster – which has just seven voyages recorded during the period, travelling to places including Grimsby, Hull, London and Southampton. Perhaps one of the most prominent places to have acted as a major centre during this time, but now fallen into relative obscurity, is Dunwich in Suffolk. Once a busy, thriving, international port, it later suffered from the harbour silting up and flooding, following a number of major storms – thus squeezing the economic life out of the town. Between 1417 and 1594, it saw 361 recorded voyages, but persistent coastal erosion now means almost all of the town lies at the bottom of the sea. Dr Lambert, assisted by Dr Gary Baker, inputted much of the information contained in the database by hand – painstakingly transferring information about ships’ masters, tonnage, manpower and destinations, from original documents to digital sources. They are keen to receive queries and contributions, case studies of individual masters and/or ships, and any help with the location or re-location of ports. The team can be contacted via medievalandtudorships@gmail.com. 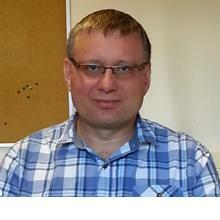 Dr Craig Lambert is an Associate Professor in Maritime History at the University of Southampton.